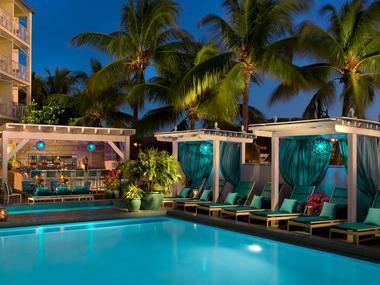 Located on the famous Zero Duval Street in Key West, Ocean Key Resort & Spa is one Key West's top luxury resorts. 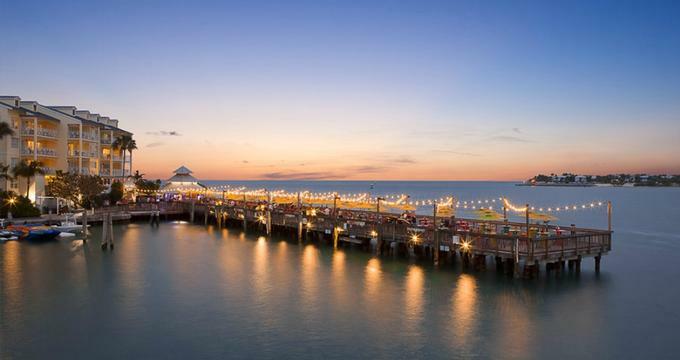 Overlooking the famous Sunset Pier - famed for its daily ‘Sunset Celebration' and the sparkling Gulf of Mexico, this luxurious boutique resort offers deluxe accommodations, a world-class spa, and award-winning restaurants. The acclaimed tropical resort is set next to Mallory Square in historic Old Town Key West and is within walking distance of a variety of lively entertainment, excellent restaurants, historic sites and beautiful beaches. 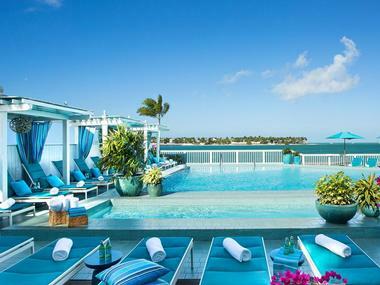 Island luxury meets barefoot elegance in the gorgeous guest rooms and suites at the Ocean Key Resort & Spa, which boast a spacious blend of opulence and flair. Guest rooms and suites vary in size and layout however, all feature Caribbean-inspired decor and furnishings, private bathrooms with walk-in showers and whirlpool baths, spacious living areas, and private balconies with gorgeous views of Key West's historic Duval Street or the shimmering Gulf of Mexico. Modern conveniences abound, such as flat-screen plasma televisions with cable channels, fully-stocked minibars, complimentary wireless Internet. Partial Ocean View Guestrooms are 350 square feet in size and feature queen-size beds, private bathrooms with enclosed showers, whirlpool tubs, thick bathrobes and towels and organic bath products. Spacious living areas have plasma televisions and minibars and private balconies boast partial views of the Gulf. Deluxe Oceanfront Guestrooms offer direct views of the Gulf from private balconies and are decorated in deep shades of teals and blues. These romantic suites are 300 square feet in size and offer king-size beds, en-suite bathrooms with enclosed showers, spa bathtubs and separate marble baths, spacious writing desks and chairs, in-room minibars and wireless high-speed Internet. 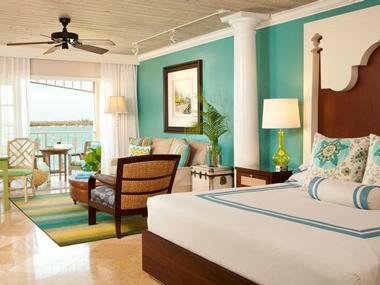 Decorated in soft seaside hues, Ocean Key suites are luxurious and romantic with Caribbean-inspired furnishings and local art adorning the walls. Suites range from 600 to 1200 square feet in size and are available in several configurations with varying number of rooms. Junior Suites are the smallest of the suites at 600 square feet and feature king-size beds with extra queen-size sleeper sofas, private bathrooms with enclosed showers and whirlpool bathtubs, and balconies overlooking the Gulf of Mexico or Duval Street. Modern conveniences abound, such as flat-screen plasma televisions with cable channels, fully-stocked minibars, complimentary wireless Internet. Two-bedroom Harbor or Island View Suites are 1,200 square feet in size and feature two bedrooms with king and queen-size beds and two en-suite bathrooms with marble showers and spa bathtubs. Spacious living and dining areas have seating for six, and modern amenities abound, including flat-screen plasma televisions with cable channels, fully-stocked minibars, complimentary wireless Internet. 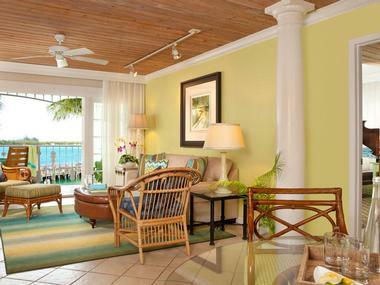 Private balconies boast a mixture of views from the Marina and the Key West Harbor to Duval Street. The crème de la crème of the resort's accommodation is the Penthouse Suite. This grand abode is located on the top floor of the hotel and offers sweeping panoramic views. The 1,200 square foot suite features two bedrooms with king-size beds, two en-suite bathrooms with marble showers, spa and soaking bathtubs, spacious living and dining areas with a teak dining table for six, and modern amenities, including flat-screen plasma televisions with cable channels, fully-stocked minibars, complimentary wireless Internet. 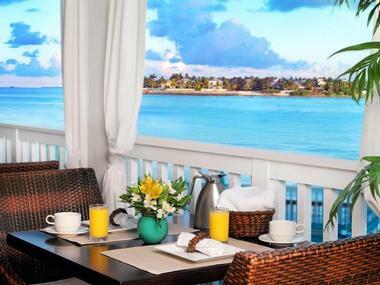 Ocean Key Resort & Spa is home to the highly acclaimed Hot Tin Roof restaurant. 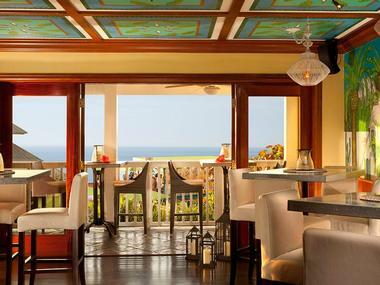 Named in honor of famous playwright, Tennessee Williams and his well-known play, Cat on a Hot Tin Roof, the award-winning restaurant serves a menu of seasonal Caribbean-inspired cuisine with a mix of seafood, meat, and vegetables prepared in a unique culinary style dubbed ‘conch-fusion'. Liquid Lounge and Bar offers a casual menu of poolside fare featuring appetizers, light meals, and snack baskets, while the famous Sunset Pier is the best place for a lively evening out of good food, wine, and entertainment. 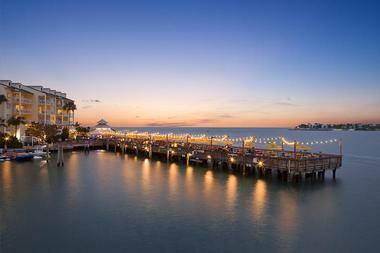 Nestled between Key West Harbor and the famed Mallory Square, the Pier is packed with a variety of restaurants and bars which serve a range of cuisine from raw oysters and signature seafood dishes to authentic Caribbean specialties. Ocean Key Resort & Spa offers an array of amenities for guests to enjoy ranging from in-house conveniences to outdoor activities and excursions. Resort amenities include daily newspapers and morning coffee in the lobby, fruit-water throughout the day, complimentary high-speed wireless Internet throughout the property, complimentary local telephone calls, chilled pool towels for use at the Liquid Lounge, and beach towels. The resort also has a fully equipped business center with computers and related services such as printing, copying, faxing, and emailing, as well as a state-of-the-art fitness center with treadmills, ellipticals, and stationary bikes. The Liquid Lounge Pool and Bar is the perfect place to unwind - either lazing in the sun on the pool deck by day or sipping colorful cocktails as the sun sets by night. Liquid Lounge offers a range of complimentary services, including fruit-infused water, frozen towels, magazines and newspapers, chaise covers and pool towels, and unique Coco Mango-infused towels. The resort is ideally located within walking distance of the Old Town, Mallory Square, and Key West Harbor, while slightly further afield are beautiful and historical landmarks like the Fort Zachary Taylor State Historic Site. Hailed as being one of the best spas in Key West, SpaTerre offers an exclusive range of spa treatments that combine indigenous oils and herbs with ancient Eastern wellness practices create exotic, rejuvenating experiences. The spa menu features Balinese spa treatments and Thai body rituals that are tailor-made to invigorate the mind and body, as well as a range of massage therapies, body treatments, facials and enhancements, skincare and salon services. SpaTerre's professional staff of therapists cater for every need, using the healing properties of flowers and spices to enhance the already revitalizing experiences. Signature treatments include the Javanese Ritual, the Tropical Essence Spa Massage, the Duval Detox Wrap, the Island Fresh Scrub, and Key Lime Margarita Spa Pedicure. Boasting one of the most beautiful wedding locations in Florida, Ocean Key Resort & Spa offers nearly 9,000 square feet of wedding facilities along with several beautiful outdoor wedding locations for intimate gatherings or large groups of up to 250 people. The deluxe resort offers a variety of exclusive wedding packages that include rehearsal dinners and bridesmaid lunches, off-site ceremonies, and poolside wedding receptions. A team of dedicated catering services professionals takes care of every detail from flower and seating arrangements to cuisine and beverages. Ocean Key Resort & Spa also offers versatile meeting and conference spaces that can cater for groups of 20 to 250 people. A variety of indoor and outdoor venues are available from the Mallory Room and Marina Garden to the Ocean Terrace, Sunset Pier, and an 870-square-foot ballroom. All spaces are fully equipped with state-of-the-art technologies, including audiovisual equipment and wireless high-speed Internet.